Tired of the low conversion rate of mobile landing pages, we developed a platform for marketers to send traffic to engaging, mobile-friendly Facebook Messenger. In Messenger, a chatbot ushers users through the conversion process, step-by-step. Are simple and quick — no coding required. Engage users as they qualify leads. Support follow-up offers to audience segments. Are free to build, launch and use. Don’t dump your valuable traffic onto clunky website landing pages and hope visitors convert. Using Chatbot Conversion Forms in Facebook Messenger! Chatbot conversion forms help you get more leads, sales, and signups within an engaging content experience. 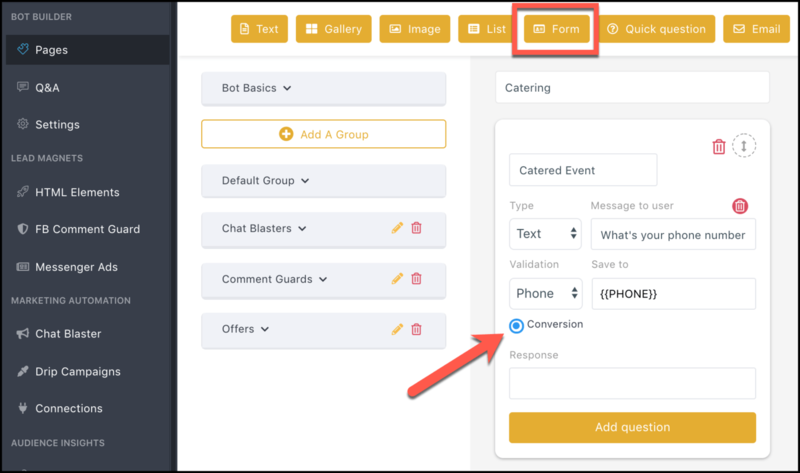 MobileMonkey is the easiest way to build and launch custom chatbot conversion forms so you can launch campaigns, faster. Using the Quick Question or Form widgets in the visual content builder is as easy as click, type, collect. Choose from multiple-choice fields and text input fields. Match your offer to your visitor as you build conversion funnels. Add custom variables to save attributes to your contacts you can use to create audience segments for follow-up later. Quick Questions allow you to save attributes to your contacts’ profiles with ease. String Quick Questions together to qualify leads and customize conversion funnels based on user selections. Forms, as you’d expect, let you collect multiple fields of lead information. Like Quick Questions, Form data saves custom variables to contacts. Conversion rates of Facebook Messenger forms outperform website landing pages because of Messenger’s huge advantage — chatbots engage every step of the way! Every response is added to that customer profile — key to staying engaged with follow-up offers in Messenger! Compare that to unassisted landing pages where one wrong question can lead to that back button and zero customer info. Plus the Messenger chat experience is always mobile-friendly. Don’t risk small tap spaces and the questionable layout of forms resized to mobile. Along with the most engaging way to do lead qualification, Facebook Messenger has a unique advantage – follow-up messaging to interested audience segments within the same channel! Combine easy-to-build conversion forms with audience-based list building and marketing automation in Facebook Messenger. So much win. Build Chatbot Conversion Forms for Free! How would you like to launch campaigns without landing page developers or expensive landing page software? Conversion forms in Facebook Messenger are free to build and fast to launch in MobileMonkey – with better engagement and conversion rates. Just start sending traffic today!